As rumored, the 3.5mm headphone jack is gone. Users have to shell out for a pair of Bluetooth headphones -- like Apple's AirPods -- or buy a $9 audio adapter. 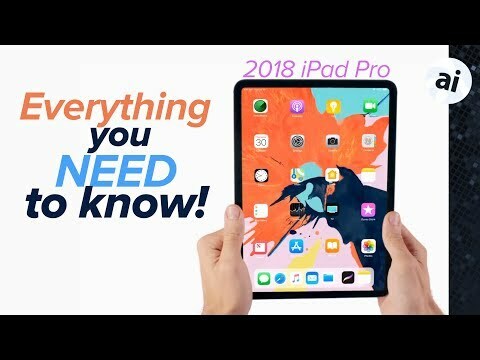 Powering the new iPad Pro is Apple's latest A12X Bionic system-on-chip, a 7-nanometer beast that builds on the A12 Bionic in iPhone XS and XR. Like its smartphone siblings, iPad Pro's processor gets the new 8-core Neural Engine -- a first for iPad. "This means users can connect an external 5K display, extra storage or even charge their iPhone with a USB-C to Lightning cable." Define extra storage? I cannot find anything about that on Apples Site. Looks like it can see the same external devices as before, Like cameras, keyboards and such. USB-C Hard drives and Flash drives are not mentioned. If the RAM increase is limited to the 1TB model, that's probably the only thing that would qualify as a disappointment to me with these iPad Pros. Stunning product updates, at least on paper. I love my current 12.9” iPad Pro but it is truly unwieldy to use in portrait orientation. The new design looks like it addresses this very nicely and bumps up performance and capacities significantly. The iPad Pro products are definitely in a class by themselves with nothing remotely in sight. Microsoft is tethered to its legacy and seems incapable of covering the last mile to deliver a fully touch optimized user experience in a tablet form factor without a mouse dependency. Who knows, maybe google will finally slough off the half baked Android tablet user experience to the Android ankle biter minions and do something real with Chrome on a tablet - and in three to five years has a critical mass of tablet optimized apps to make it a worthy alternative. Of course this assumes Apple immediately halts any further refinements and innovations for iPad. Unlikely. External storage is already supported over Lightning on iOS via their respective apps. There is no reason to think that that will change with USB-C. I was excited to read that as well. A google search on other publications point out that Apple stated external storage would not work over the usb-c. I'm wondering if it would be the same thing with lightening where Apple means its not baked in but require a half-assed third party app. Apple keeps toting the iPad as a laptop replacement or as powerful as a regular computer yet allows such glaring issues to persist such as file access, storage, transfer, etc. Vadim didn't say anything about "plain" USB-C hard drives or Flash Drives. There are devices that are compatible with Files now, and like MacPlusPlus said, other devices are have been usable with vendor-supplied apps. This looks pretty cool; kind of like when I see a Tesla drive by. But I can't afford, nor do I need it. But if you need the tool, you buy the tool. I am sure Apple will sell lots and lots of these. So, if you connect the new iPad Pro to a 4K or 5K monitor, will you get a fullscreen? I've seen shots of still images and video playing at full screen, but would the home screen and other apps be at fullscreen? Someone apparently snuck a USB-C flashdrive in and yeah, apparently the only file types currently recognized are photos and videos, exactly like the camera connection kit. C'mon, Apple, if you want me to take this seriously as a computer let me copy a Pages file onto a USB stick and have the files app be able to take it off. You share a Pages document to the flash drive’s app instead of Files app. What is the difference? The video script that I wrote said: "This means you can charge your phone with it and connect it to external devices like cameras or even an external 5K display, which will mirror everything onto that display." Not sure who added the external storage bit.
" An Apple-designed 7-core GPU is said to be twice as powerful as the 12-core GPU in the A10X Fusion. " FWIW, Apple merged the number of ALUs in two old cores into one, so the 7 core is worth 14 old cores + architecture improvements. I always hated the word "core" for GPUs, just list the number of shaders/ALUs, Core is an arbitrary grouping of them not comparable across architectures. Can’t wait until ours get here. Only really annoying thing right now is that unlike past models, there aren’t any cases for this model yet. Apple has a sleeve, and covers, as well as they keyboard cover, but nothing that slips on the back to protect it when you put it down. Checked Amazon, and nothing there either. This has never happened before. I guess the knowledge of what the form would be was too late this year. I was hoping to have a case by the time it arrives on the 7th. Oh well, i’ll Just have to keep checking every day. Why is the iPad considered so thin? It’s not..... look at the camera bump, that’s the true thickness of the device. Worse, it doesn’t sit flat without a case. “The smaller model squeezes its 11-inch screen into a chassis roughly the same size as last year's 10.5-inch iPad Pro”. ”In fact, both models have 25 percent less volume than last year”. Help us out here. Other commentators have pointed out the same thing. Could you name one external hard drive that one can connect to an iOS device via Lightning or USB-C cable that allows for transfer of any files both ways? I don’t mean drives with built in WiFi connections as a kludgy work-around. Nor USB/Lightning thumb drives. What drives “compatible with Files now” are out there? Well, no. That’s not how things are measured. If there is a small portion sticking out, it’s usually measured additionally. So if there are feet on a device, the size is given, and the feet are given too. Is there a list of Files-compatible devices?